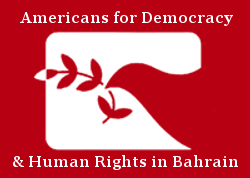 On Wednesday, 1 August 2018, Americans for Democracy & Human Rights in Bahrain (ADHRB) and 11 other non-governmental organizations (NGOs) met with representatives from the Departments of State and Treasury, and the government of the United Kingdom to discuss sanctions recommendations under the Global Magnitsky Human Rights Accountability Act. In their meeting, representatives of the American Bar Association, ADHRB, Bruno Manser Fund, Boat People SOS, Freedom House, Global Witness, Human Rights First, Human Rights Watch, PEN America, Robert F. Kennedy Human Rights, The Sentry, and the Victims of Communism Memorial Foundation discussed sanctions recommendations in 21 individual cases concerning alleged human rights abuses and acts of corruption in 14 countries. The information provided by these organizations to the U.S. government today calls for the imposition of targeted sanctions against human rights abusers and corrupt actors in Azerbaijan, Bahrain, Burundi, Cambodia, the Central African Republic, China, the Democratic Republic of Congo (DRC), Honduras, Hungary, Malaysia, Russia, Sudan, Turkey, and Vietnam. Members of the group also voiced support for Global Magnitsky Act sanctions to be imposed against human rights abusers in Burma and Egypt. ADHRB has welcomed the U.S. government’s recent actions to sanction human rights abusers and corrupt actors under the Global Magnitsky Act, including designations of individuals in Burma, Cambodia, the Dominican Republic, China, the DRC, Gambia, Guatemala, Nicaragua, Pakistan, Russia, Serbia, South Sudan, Turkey, Ukraine, and Uzbekistan. However, we also call upon the Trump Administration to sanction human rights violators and corrupt actors wherever so doing can deter violations and protect victims, particularly in the Middle East and with respect to America’s security partners. The Global Magnitsky Human Rights Accountability Act is the most comprehensive human rights and anti-corruption sanctions tool in U.S. history. Passed with bipartisan support and signed into law in December 2016, the law is named after whistle-blower Sergei Magnitsky, who was imprisoned and murdered in 2009 by Russian authorities after exposing a large-scale fraud. Under the act, the U.S. government may sanction foreign individuals and entities found to have committed gross violations of human rights, or to have engaged in significant acts of corruption, by subjecting designees to asset freezes and visa restrictions. The law expands upon the 2012 Magnitsky Act, which applied only to Russian individuals and entities. To date, the U.S. government has sanctioned 24 individuals and 56 associated entities through five separate rounds of Global Magnitsky Act sanctions designations. Wednesday’s meeting involved members of a coalition of NGOs organized by Human Rights First that have worked together to bring credible information to the U.S. government on potential sanctions designees, including government officials in Bahrain.